UPDATE: I’ve added NOAA’s description of the PDO index toward the end of the post, before the closing. During the earlier discussions of the upcoming El Niño event, the topic of the Pacific Decadal Oscillation or PDO was raised a number of times. Apparently, it’s time again to discuss what the PDO does and does not represent. I’m trying a couple of new approaches this time. Hopefully, it will be more suitable for those new to the topic. The intents of the post are to dispel many of the misunderstandings about the PDO and to correct the misinformation about the relationship of the PDO with El Niño and La Niña events. The PDO index represents the spatial pattern of the sea surface temperature anomalies in the extratropical North Pacific (20N-65N)…not the sea surface temperature anomalies themselves. A strong positive PDO index value indicates the sea surface temperature anomalies of the eastern extratropical North Pacific are warmer than the western and central portions, which is a spatial pattern created by El Niño events. On the other hand, a strong negative PDO index value indicates the sea surface temperature anomalies of the western and central portions of the extratropical North Pacific are warmer than the eastern portion, and that’s a spatial pattern created by La Niña events. Studies of salmon production (fishing) in the early 1990s noted abrupt changes in productivity that lasted for multidecadal periods. These changes in salmon production were tied to the climate of the North Pacific Ocean. 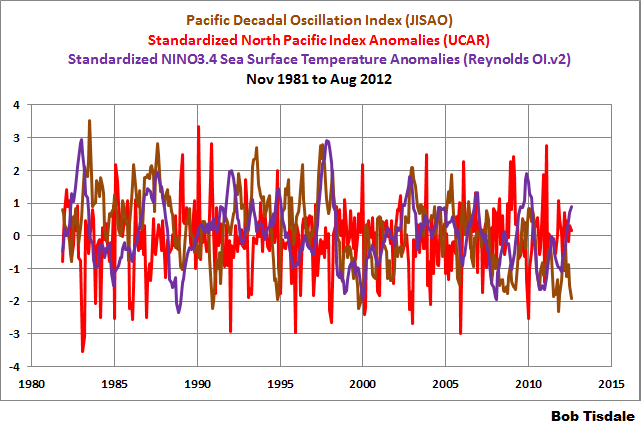 The term “Pacific Decadal Oscillation” was coined in the mid-1990s as a result of that research. The method for calculating the PDO index data was first presented in a 1997 paper by Zhang et al. ENSO-like Interdecadal Variability: 1900–93. In that paper the PDO is referred to as NP, for extratropical North Pacific poleward of 20N. There’s a very important quote from Zhang et al. (1997) and we’ll return to it later in the post. El Niños and La Niñas take place in the tropical Pacific, so climate scientists use the extratropical North Pacific for the PDO data to minimize the direct influence of El Niño and La Niña events on the PDO data. The PDO index data is maintained by the Joint Institute for the Study of the Atmosphere and Ocean (JISAO). See their Pacific Decadal Oscillation (PDO) webpage, and their PDO Index Monthly Values webpage for data. When reviewing the JISAO PDO webpage, consider that the latest paper on that webpage is from the year 2000 and that the webpage is dated that same year. Much has changed in the understanding of the PDO since that time. The use of the words “warm” and “cool” when discussing the phases of the Pacific Decadal Oscillation may lead to some confusion. “Warm” and “cool” are tied to the phase of the eastern portion of the North Pacific, and how the eastern portion relates to the western-central portion, not the actual surface temperature of the entire extratropical North Pacific. That is, when the PDO is in the “warm” phase, the eastern portion of the North Pacific (north of 20N) is warmer than the west-central portion, and vice versa for the “cool” phase. Consider this when thinking of the PDO index data and its “warm” and “cool” phases. It’s a simple way to determine that the PDO does not relate to the surface temperatures of the North Pacific. 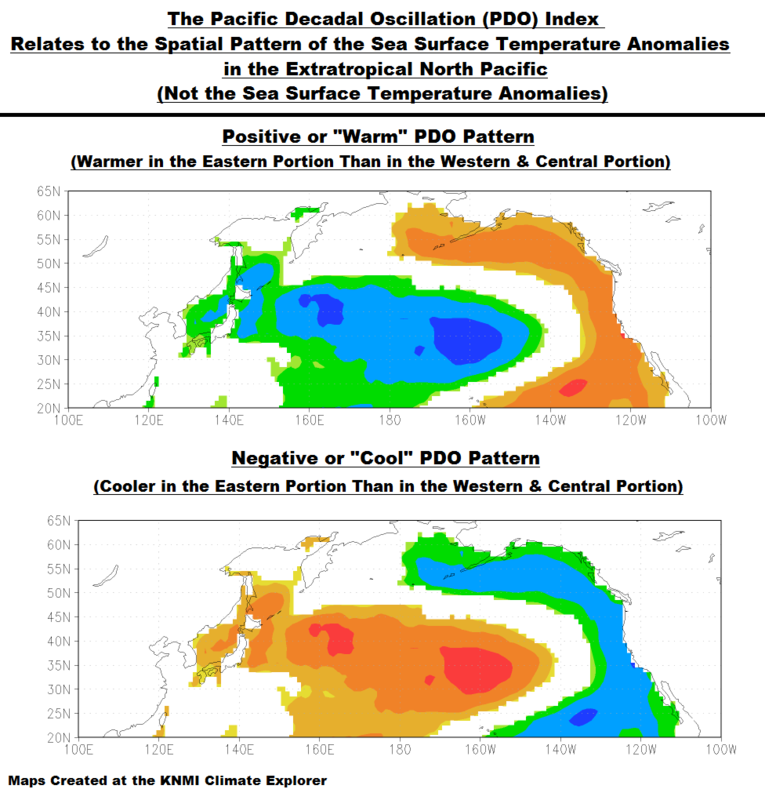 A cooling of the sea surface temperature anomalies of the western-central portion of the North Pacific can cause the PDO index to increase, and a warming of the sea surface temperatures of the eastern North Pacific can also cause the PDO index to increase. In the first example, the surface temperatures of the entire North Pacific would have cooled, and in the second, they would have warmed, but the values of the PDO index increased in both examples. Further, as we’ll illustrate later in the post, the PDO index agrees better with the opposing variations western-central portion than it does with the alike-direction changes in the eastern portion. 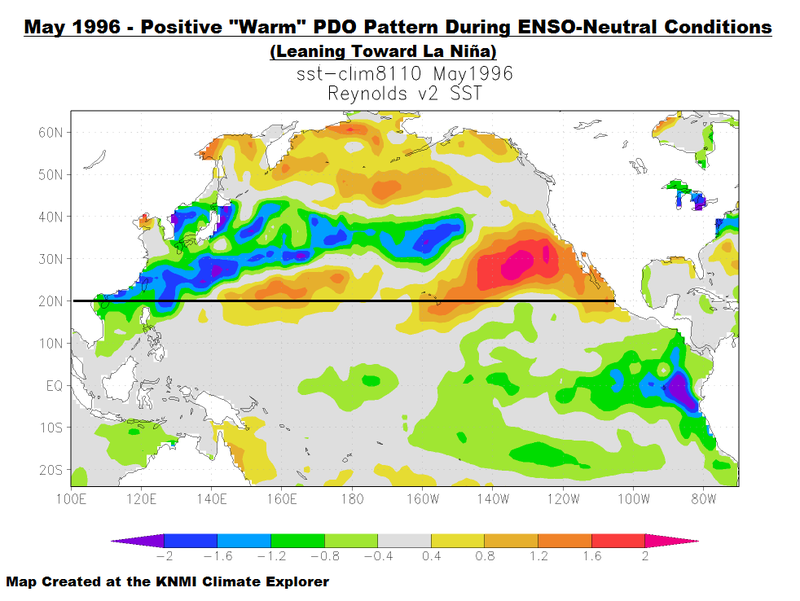 Let’s discuss what the PDO represents in more detail: A La Niña event in the tropical Pacific typically creates a spatial pattern in the extratropical North Pacific where it’s cooler in the eastern portion than it is in the western and central portions. See the left-hand cell of Figure 2. The left-hand cell illustrates the average sea surface temperature anomalies of the extratropical North Pacific for the period of July 1999 to June 2000. That’s a full year of the multiyear 1998-01 La Niña. July to June is used because La Niñas normally peak in boreal winter. 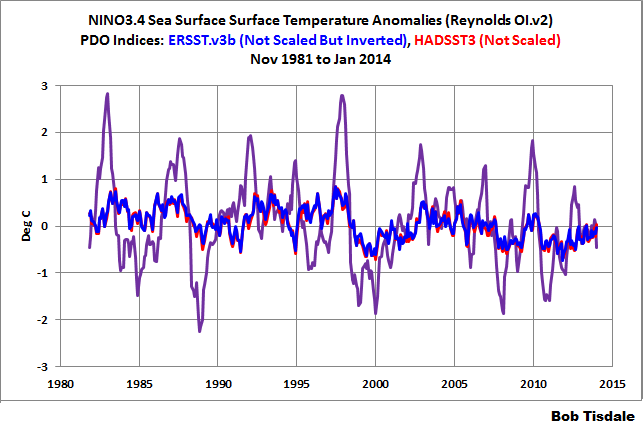 The dataset is NOAA’s satellite-enhanced Reynolds OI.v2 sea surface temperature data. Note how it’s cooler in the eastern North Pacific than it is in the western and central portions. That’s a textbook spatial pattern in the extratropical North Pacific caused by a La Niña. It’s also a classic “cool” PDO spatial pattern. An El Niño event creates the opposite spatial pattern, where it’s warmer in the eastern extratropical North Pacific and cooler in the western and central portions, and that also relates to a “warm” PDO spatial pattern. It is often said that the PDO pattern is the dominant spatial pattern in the extratropical North Pacific, and that makes sense because the PDO pattern represents the El Niño- and La Nina-like pattern in the extratropical North Pacific…and…El Niños and La Niñas are the dominant mode of natural variability for the global oceans. 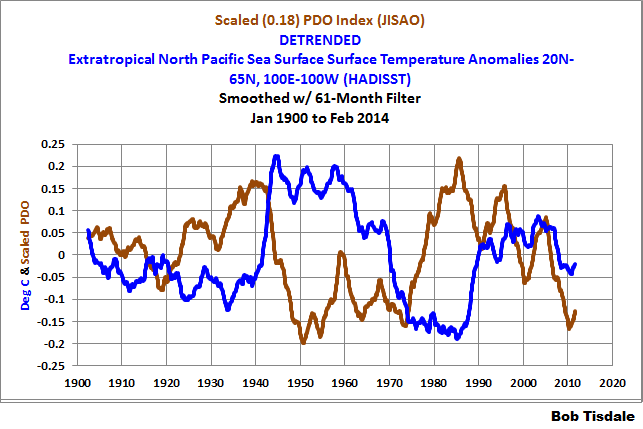 The PDO data are not sea surface temperature data of the North Pacific. The PDO data, on the other hand, are determined from the sea surface temperature data there, using a statistical analysis called Principal Component Analysis. Note the distinction. Once again: the PDO data are determined from the sea surface temperature data of the North Pacific, but they do not represent the sea surface temperatures there. Now, I’m not intentionally trying to make this difficult to understand, but that’s the reality of the PDO index data. The PDO index data is the 1st Principal Component (PC1) of the sea surface temperature anomalies of the extratropical North Pacific (north of 20N)…after the global sea surface temperature anomalies are subtracted from the North Pacific sea surface temperature anomaly data in each 5-deg latitude by 5-deg longitude cell. One more step: The 1st Principal Component is then standardized (divided by its standard deviation) to create the PDO data. And in the case of the PDO, the standardization greatly amplifies the variability of the PDO, making the PDO index appear more significant than it really is. The scaling of the PDO will be confirmed later in the post. So the PDO data are a very abstract form of the sea surface temperatures of the extratropical North Pacific. It may be easiest to think of the PDO data in another way—as representing how closely the spatial pattern in the North Pacific at any point in time matches the spatial pattern created by La Niña and El Niño events. If the spatial pattern closely matches the La Niña pattern in Figure 2, then the PDO index value would be negative. The closer the match in the spatial pattern to one created by La Niña events, the greater the negative value. And the opposite holds true for the El Niño-related spatial pattern. The closer the resemblance to the El Niño pattern, the greater the positive PDO index value. For the right-hand map in Figure 2, I used the Empirical Orthogonal Function analysis (EOF1) feature of the KNMI Climate Explorer, with the Reynolds OI.v2 sea surface temperature data. Empirical Orthogonal Function Analysis is the same as Principal Component Analysis but it also determines the associated spatial patterns. (Note: I took a shortcut with that map. Instead of removing the global data from each grid, I simply had the software in the KNMI Climate Explorer detrend the North Pacific sea surface temperature data. The results are close enough for this discussion.) So the map on the right in Figure 2 presents a classic cool PDO pattern, which would be represented by a negative PDO index value. A zero PDO index value indicates that La Niña-related or El Niño-related patterns do not exist at that time. Let’s consider that La Niña-related (cool-PDO) spatial pattern from Figure 2, which shows up in the PDO index as a negative value. The actual sea surface temperatures of the North Pacific can rise and fall, but just as long as that spatial pattern remained fixed (cooler in the east and warmer in the west and central North Pacific) the PDO index would remain at a constant negative value. While it’s not determined this way, sometimes it’s easier to think of the PDO as a temperature difference between the eastern extratropical North Pacific and the western and central portions. Again, it’s very important to understand that the PDO index does not relate to the actual sea surface temperature anomalies of the North Pacific (north of 20N). The PDO index value only relates to the spatial pattern there. We’ll confirm this again later in the post, using data. Note also that only the extratropical North Pacific is presented in Figures 1 and 2. The PDO data are derived from sea surface temperature data in that location and that location only. The PDO data do not represent the tropical Pacific or the ENSO events that take place in the tropical Pacific. 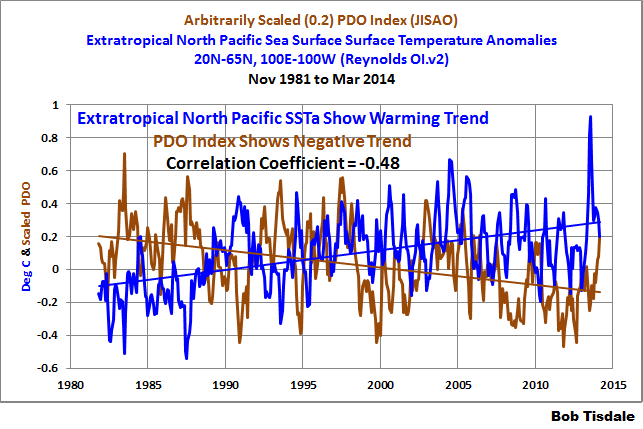 The PDO data also do not represent the Pacific Ocean as a whole. 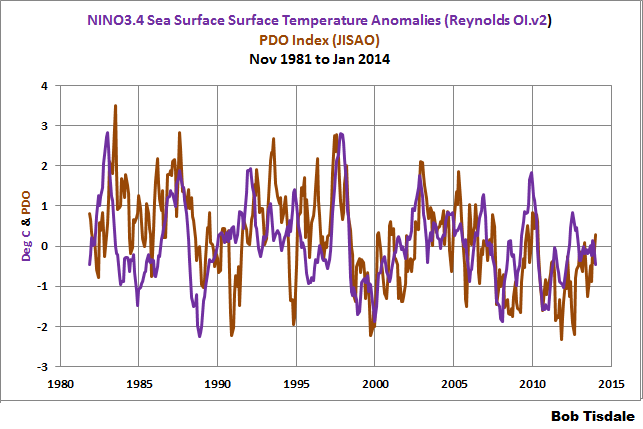 Figure 3 is a time-series graph that presents the PDO index data and the Reynolds OI.v2 satellite-enhanced sea surface temperature anomalies for the NINO3.4 region. The NINO3.4 region sea surface temperature anomalies are a commonly used index for the timing, strength and duration of El Niño and La Niña events. The El Niños are the large upward spikes in the sea surface temperatures of the NINO3.4 region, and the La Niñas are the downward ones. 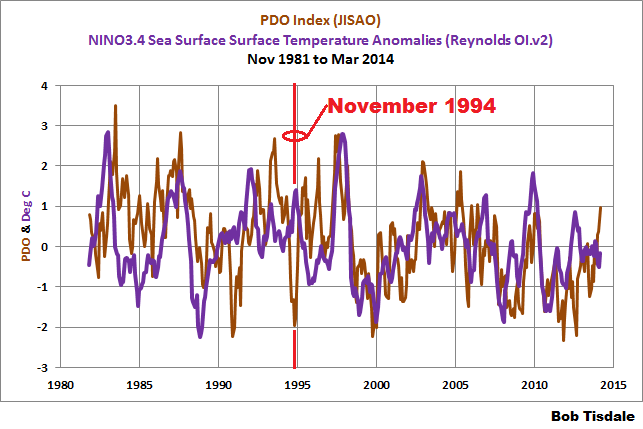 The NINO3.4 data have not been standardized, but the PDO index has been. In the case of the PDO, the standardization multiplies its year-to-year variations. So the standardization greatly exaggerates the importance of the PDO index. The monthly PDO index data are quite variable (see the graph here) so both datasets have been smoothed with a 12-month running-mean filter in Figure 3. You’ll note that the two datasets run in and out of agreement. That indicates that not every La Niña (El Niño) creates a classic La Nina-like (El Niño-like) spatial pattern in the extratropical North Pacific. The reason that the PDO index does not mimic an ENSO index at all times is the spatial patterns of the sea surface temperatures in the North Pacific are also affected by the sea level pressures (and the related variations in wind patterns) there. (We’ll confirm this in the next section.) That is, the sea level pressures and the strength and direction of the winds (basically weather) in the extratropical North Pacific can suppress or enhance the El Niño-like or La Niña-like spatial patterns there. That causes the year-to-year and the multidecadal variations in the PDO index to be different than an ENSO index. The differences in the annual variability can be seen in Figure 3, and the differences in the multidecadal variations between the PDO index and our ENSO index can be seen in Figure 4. Figure 4 compares a long-term ENSO index (NINO3.4 sea surface temperature anomaly data based on the HADISST dataset) to the long-term monthly PDO index. Both datasets have been smoothed with 61-month filters to suppress the year-to-year variations and to highlight the differences in their multidecadal variations. (See the monthly long-term PDO and NINO3.4 data here.) 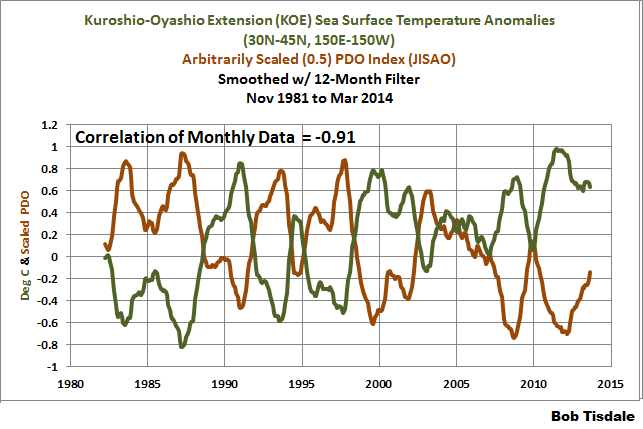 It’s very obvious that ENSO and PDO data both show long-term variations. The smoothed NINO3.4 data indicate that there are decadal and multidecadal variations in the strengths, frequency and durations of El Niño and La Niña events. And the smoothed PDO index shows that there are decadal and multidecadal variations in the El Niño- and La Niña-like spatial patterns in the extratropical North Pacific. Because the sea level pressures and wind patterns in the extratropical Pacific also have decadal and multidecadal variations, the PDO index does not track the ENSO index over these timeframes. In the North Pacific, the atmosphere and the ocean display a trend of co-variance with aperiod [sic] of about 20 years. 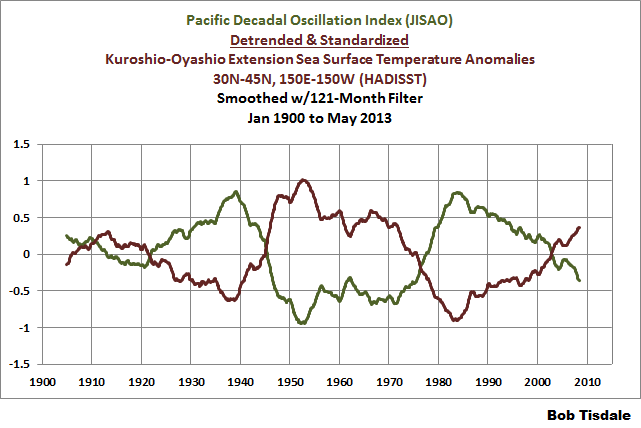 This variability is called the Pacific Decadal Oscillation (PDO). We’ll discuss the North Pacific Index in the next section. This long-term variability of the PDO and its relationship with El Niño and La Niña events in the equatorial Pacific is easier to see with multiyear filters…as shown above in Figure 4. On monthly and annual timescales, the variations in the PDO data can, at times, be remarkably similar to those of the ENSO index, as shown in Figure 3 above, and at times they can be quite different. The monthly North Pacific Index data from UCAR are here. They are also available in anomaly form through the Monthly climate indices webpage at the KNMI Climate Explorer (through August 2012). Looking at the monthly North Pacific Index anomalies, the PDO index and the NINO3.4 sea surface temperature anomalies during the satellite era of sea surface temperatures, the relationships between the North Pacific Index data and the other two indices is hard to imagine. See Figure 5. Smoothing all three datasets with 12-month filters doesn’t seem to help much either, as shown in Figure 6. So 4 years ago, I presented a very simply way to show the relationship between the North Pacific Index data and the other two variables. (That earlier post is here.) I subtracted the PDO index data from standardized NINO3.4 sea surface temperature anomalies, and compared that difference to the North Pacific Index data, where the difference and the North Pacific Index data were both smoothed with multiyear filters. The long-term variations mimicked one another reasonably well over much of the term of the data. In Figure 7, for a change of pace, I used Kaplan SST-based NINO3.4 data and smoothed the data with 121-month filters. The multidecadal variations in the North Pacific Index (sea level pressure) mimic the difference between the ENSO and PDO indices from the early 1920s to present. Considering how sparse the data are before the early 1920s, the divergence then is not unexpected. Figure 8 presents two correlation maps for the satellite era of sea surface temperatures. The top map shows the correlation between the North Pacific Index and the sea surface temperature anomalies of the extratropical North Pacific. The North Pacific Index creates a weak PDO-like pattern. And in the bottom map is the correlation between NINO3.4 sea surface temperature anomalies (our ENSO index) and the sea surface temperature data for the same region. ENSO creates a strong PDO-like pattern. I believe it’s safe to say that the difference between the long-term variations in the Pacific Decadal Oscillation and ENSO is related to the sea level pressure of the North Pacific as expressed by the North Pacific Index (and interrelated wind patterns), and that ENSO dominates over the sea level pressure on short-term timescales. The heading is a quote from the concluding comments of the Newman et al. (2003) ENSO-Forced Variability of the Pacific Decadal Oscillation. 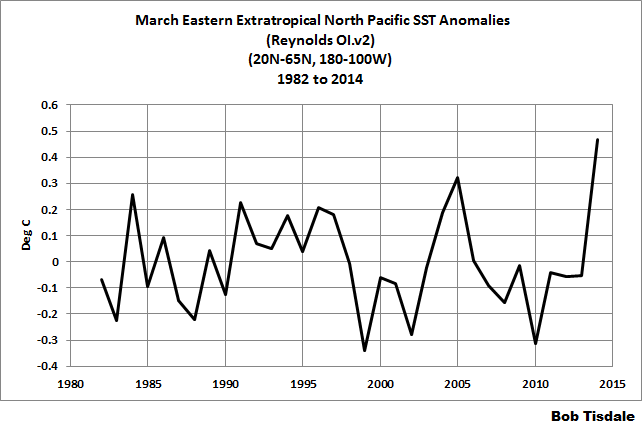 In other words, ENSO drives the Pacific Decadal Oscillation, not the other way around. Figure 9 is cell d of Figure 1 from Newman et al. (2003). ENSO also leads the PDO index by a few months throughout the year (Fig. 1d), most notably in winter and summer. Simultaneous correlation is lowest in November– March, consistent with Mantua et al. (1997). The lag of maximum correlation ranges from two months in summer (r ~ 0.7) to as much as five months by late winter (r ~ 0.6). During winter and spring, ENSO leads the PDO for well over a year, consistent with reemergence of prior ENSO-forced PDO anomalies. Summer PDO appears to lead ENSO the following winter, but this could be an artifact of the strong persistence of ENSO from summer to winter (r = 0.8), combined with ENSO forcing of the PDO in both summer and winter. Note also that for intervals less than 1yr the lag autocorrelation of the PDO is low when the lag autocorrelation of ENSO (not shown) is also low, through the so-called spring persistence barrier (Torrence and Webster 1998). This also agrees with the findings of the paper that first presented the PDO index: Zhang et al. (1997) ENSO-like Interdecadal Variability: 1900–93. Recall that Zhang et al. refer to the PDO as “NP”. For an ENSO index, they use the Cold Tongue Index (CT) in place of NINO3.4 SST anomalies. The Cold Tongue Index represents sea surface temperature anomalies of the region bordered by the coordinates of 6S-6N, 180-90W, where NINO3.4 region occupies 5S-5N, 170W-120W. 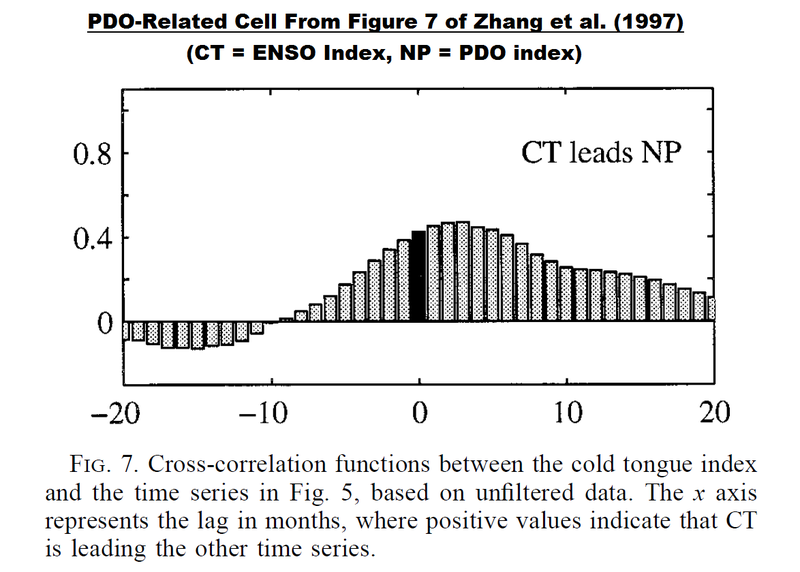 In the bottom cell of Figure 7 of Zhang et al., shown here as Figure 10, they illustrate the cross-correlation functions between their ENSO index and the PDO. As illustrated in the original paper that calculated the PDO index, NP (PDO) lags CT (ENSO) by approximately 3 months. Thus, my repeated statement in blog comments whenever the relationship between the PDO and ENSO is discussed: the PDO is an aftereffect of ENSO…that’s also impacted by the sea level pressure and related wind patterns of the North Pacific. There are posts and comments around the blogosphere that state something to the effect of “during a warm PDO (a multidecadal period when the PDO is positive), El Niño events are more frequent, and during a cool PDO (a multidecadal period when the PDO is negative), La Niña events are more frequent.” Expressed in that way, those comments lead people to believe that the PDO drives the frequencies, strengths and durations of El Niño and La Niña events. Because the PDO lags ENSO, the warm or cool phase of the PDO cannot drive the strength, frequency and duration of El Niño and La Niña events. It’s the other way around, “the PDO is dependent upon ENSO on all timescales”. The persons making the claims that the PDO is the driver of ENSO have cause and effect reversed, and they forget to account for the addition variability of the PDO caused by variations in sea level pressure and wind patterns. This does not mean that the sea surface temperatures of the North Pacific do not provide feedback to the tropical Pacific. Unfortunately, the PDO index does not represent the sea surface temperatures of the North Pacific. And the PDO index correlates poorly with the sea surface temperature anomalies of the eastern extratropical North Pacific. We cannot look at the PDO index and always determine if an El Niño or La Niña is occurring in the tropical Pacific. Sometimes, yes…but not always. The same holds true in the other direction: we cannot look at an ENSO index and assume the North Pacific will always have an El Niño-like spatial pattern during an El Niño, or a La Niña-like spatial pattern during a La Niña. Here are a few examples. Figure 11 presents the monthly satellite-era comparison of the PDO index and NINO3.4 sea surface temperature anomalies (our ENSO index). 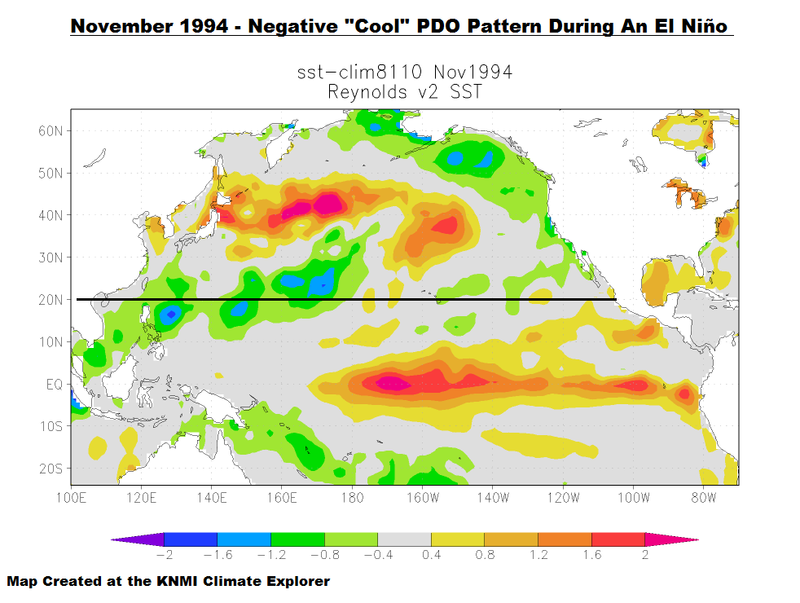 In November 1994, the PDO index was showing a strong negative value (suggesting a La Niña), while the sea surface temperatures of the NINO3.4 region are indicating a moderate El Niño was taking place. The sea surface temperature anomaly map of the tropical Pacific and the extratropical North Pacific in Figure 12 confirm both realities. The tropical Pacific is showing an El Niño event and the extratropical North Pacific is showing a “cool” PDO pattern, where it’s warmer in the western-central North Pacific than it is in the eastern North Pacific. Let’s reverse the situation. A good example is a little more difficult to find, but we’ll settle on May 1996. See Figure 13, where I’ve highlighted that month in the time-series comparison. The PDO index peaks at a relatively high value in May 1996, while the ENSO index is showing ENSO neutral conditions, but leaning toward La Niña. And we can confirm both realities with the sea surface temperature anomaly map for May 1996. See Figure 14. Let’s confirm/reinforce early statements: that the PDO index data do not represent the sea surface temperature anomalies of the North Pacific. Figure 15 includes the sea surface temperature data for that region (20N-65N, 100E-100W). Also included in the graph is the PDO index data from JISAO, which have been scaled (multiplied by a factor of 0.2) to bring their variations down into line with the sea surface temperature data. You’ll also note that I’ve had Excel add trend lines to the graph. The trends show that sea surface temperature anomalies of the extratropical North Pacific have warmed over the past 32+ years, while the PDO data show a negative trend. 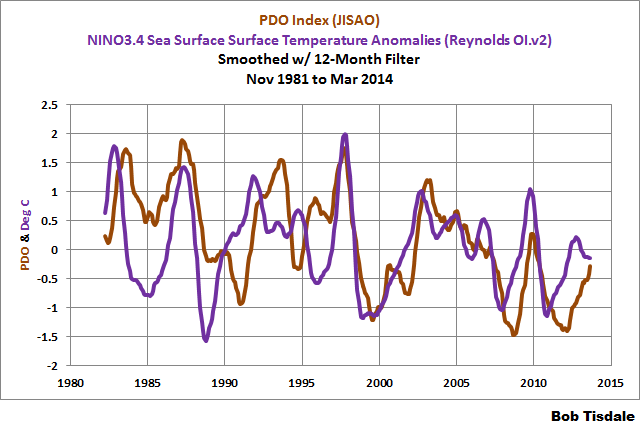 Also note the monthly variations in the sea surface temperature data and the PDO data. They also appear to oppose one another…but not always. 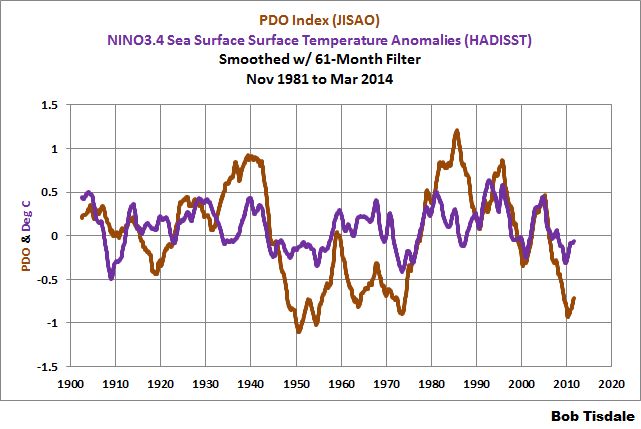 The PDO data and the sea surface temperature anomalies do have an opposing relationship but the correlation is poor. The correlation coefficient is -0.52, which is pretty bad. A correlation coefficient of -1.0 indicates a perfect negative correlation. Figure 16 presents a similar graph, but using the long-term PDO data from JISAO (January 1900 to February 2014) and the sea surface temperature anomalies of the extratropical North Pacific using the HADISST dataset. 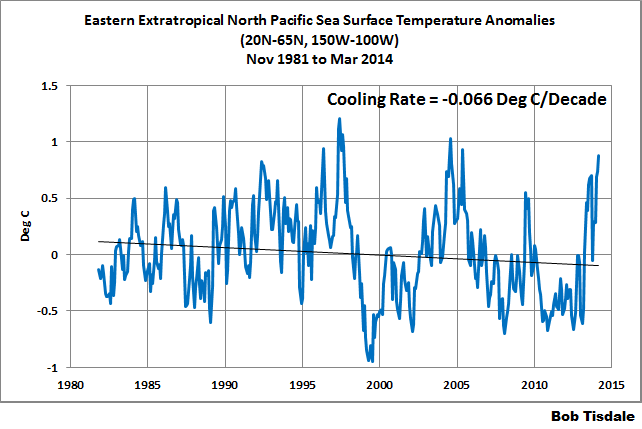 The PDO data also do not represent the sea surface temperatures of the North Pacific over the long term. In Figure 17, I’ve detrended the sea surface temperature data and compared them to the scaled PDO data. The multidecadal variations of the PDO data also do not coincide with the multidecadal variations in the sea surface temperature anomalies of the North Pacific. For more information about the multidecadal variations in sea surface temperatures, see the post Multidecadal Variations and Sea Surface Temperature Reconstructions. CAN THE PDO DATA BE USED TO DETERMINE THE CONTRIBUTION OF THE NORTH PACIFIC SEA SURFACE TEMPERATURES TO GLOBAL WARMING? It’s often noted that when the PDO is positive for multidecadal periods, global surface temperatures warm, and when the PDO is negative, global surface temperatures stop warming or cool a little. It’s is then assumed that the PDO has something to do with the warming or cooling of global surface temperatures. The problem: there is no mechanism through which the PDO can raise or lower global surface temperatures, because the PDO does not represent the surface temperatures of the extratropical North Pacific (where the PDO is derived). 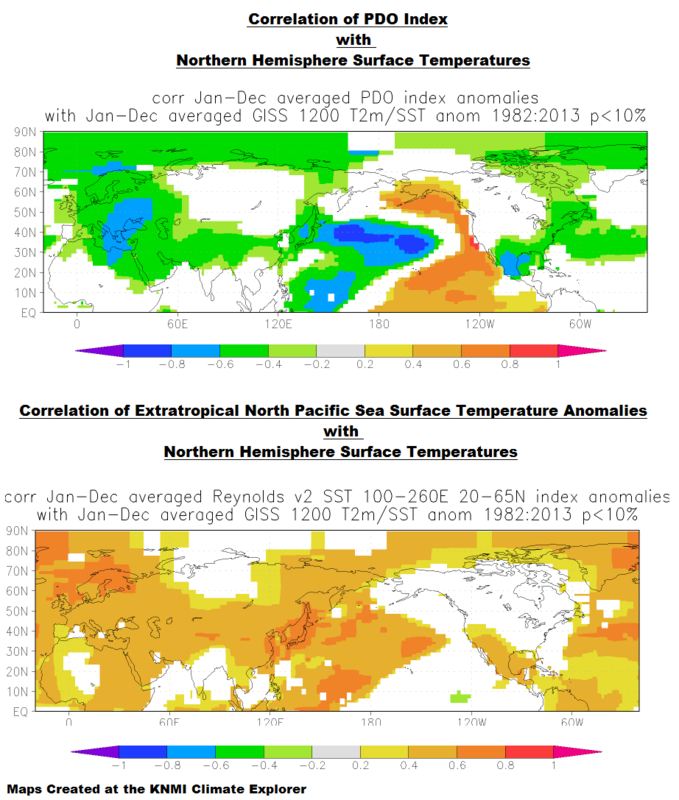 Figure 18 compares the sea surface temperature anomalies of the extratropical North Pacific with global sea surface temperature anomalies. The UKMO HADISST data are being presented. And the data have been smoothed with 61-month filters to help show the differences in the long-term variations. There are periods when the sea surface temperatures of the extratropical North Pacific run in parallel with the global surface temperature data. At those times, the sea surface temperatures are not adding to or suppressing the variations in the global data. There are periods when the sea surface temperatures of the extratropical North Pacific warm faster than the global data. At those times, the sea surface temperatures of the North Pacific (north of 20N) are adding to the warming of global sea surface temperatures. And, conversely, the sea surface temperatures of the extratropical North Pacific are suppressing the warming of global data when they are warming at a slower rate than the global data…and adding to the cooling when the surface of the North Pacific is cooling faster than they are globally. Let’s subtract the global sea surface temperature data from the data for the extratropical North Pacific. We’ll call that difference the “Extratropical North Pacific Residual”. See Figure 19. The “Extratropical North Pacific Residual” illustrates the additional variations of the sea surface temperatures of the North Pacific (north of 20N) above and beyond the global sea surface temperatures. Also included in Figure 19 is the scaled PDO index. Both datasets have once again been smoothed with 61-month filters. It’s very obvious that the PDO data do not represent the additional variability of the North Pacific sea surface temperatures. In fact, over multidecadal timeframes, the PDO data can be inversely related to the extra variability of the sea surface temperatures of the extratropical North Pacific. There’s another way to illustrate the inverse relationship between the PDO and surface temperatures, and that’s with maps that show the correlations of Northern Hemisphere surface temperatures with the PDO and with the sea surface temperatures of the extratropical North Pacific. See Figure 20. The top map shows that surface temperatures of most of the Northern Hemisphere are negatively correlated with the PDO index. That negative correlation means that when the PDO data increases, the surface temperatures for most of the Northern Hemisphere show cooling. On the other hand, the surface temperatures for most of the Northern Hemisphere are positively correlated with the sea surface temperatures of the extratropical North Pacific. See the bottom map of Figure 20. That is, the surface temperatures for much of the Northern Hemisphere warm when the surface of the extratropical North Pacific warms, and it cools when the surface of the extratropical North Pacific cools. So the answer to the question posed in the heading for this section is no. The PDO data cannot be used to determine the contribution of the North Pacific sea surface temperatures to global warming. 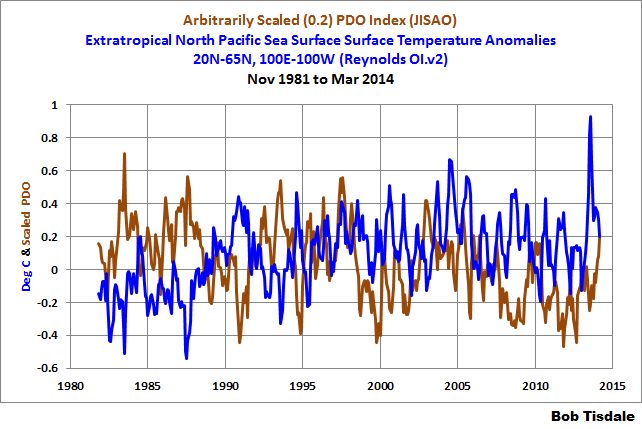 The PDO data do not represent the sea surface temperatures of the extratropical North Pacific. 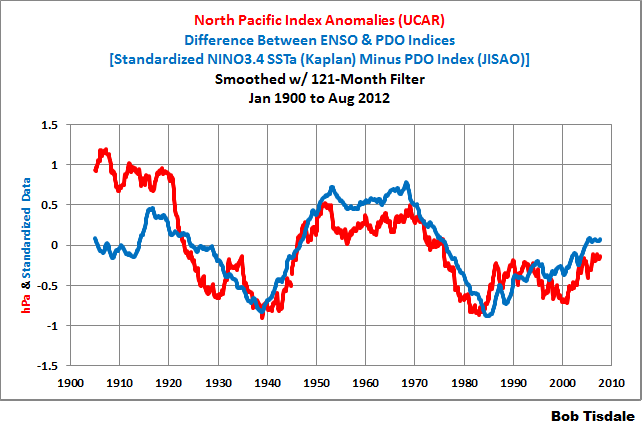 THE EASTERN OR WEST-CENTRAL PORTIONS OF THE NORTH PACIFIC: WHICH AGREES BEST WITH THE PDO INDEX? Earlier we discussed how a “warm” or “cool” PDO index value appears to be tied to the sea surface temperature anomalies of the eastern extratropical North Pacific. That is, sea surface temperatures in the eastern extratropical North Pacific tend to be elevated when the PDO is “warm”, and depressed when the PDO is “cool”. And we discussed how the west-central portion of the extratropical North Pacific is “cool” when the PDO is “warm” and, conversely, the west-central portion is “warm” when the PDO is “cool”. But, in terms of sea surface temperature anomalies, which of those two regions agrees better with the PDO index data: the eastern or the west-central? The use of the terms “warm” and “cool” draws our attention to the eastern extratropical North Pacific, but does it actually correlate well with the PDO? Let’s start with the eastern region. Figure 22 presents the sea surface temperature anomalies of the eastern extratropical North Pacific (20N-65N, 150W-100W). 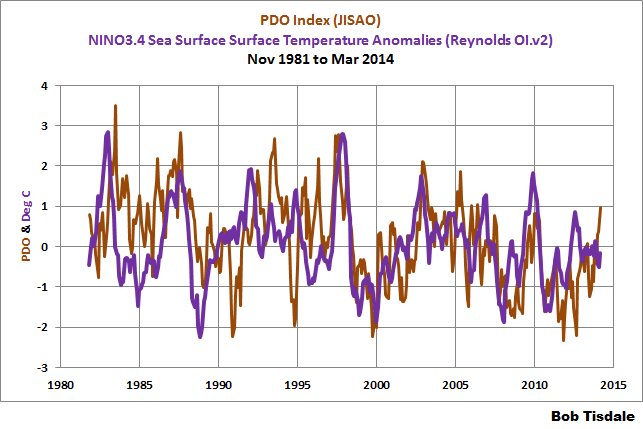 Also shown is the PDO index that has been arbitrarily scaled (scaling factor = 0.5). After the 1997/98 El Niño, the variations in the PDO and in the sea surface temperatures of the eastern region of the North Pacific (north of 20N) tend to agree with one another, but before that El Niño, there is little agreement. Overall, the two datasets correlate quite poorly since November 1981, with a correlation coefficient of 0.52. The scaled PDO index is compared to the sea surface temperature anomalies of the Kuroshio-Oyashio Extension (west-central portion of extratropical North Pacific) in Figure 23. If not for that three-year stretch from 2004 through 2006, the variations in the PDO data would mirror the variations in the sea surface temperatures of the Kuroshio-Oyashio Extension. The correlation coefficient of those two datasets is -0.91, which is much better than the eastern region (though inverted). That suggests that studies of the variability of the PDO during the satellite era and the relationship of the PDO with ENSO are, for the most part, studies of the variations in the sea surface temperatures of the Kuroshio-Oyashio Extension (not the eastern portion of the North Pacific), with the results inverted for the PDO. The PDO index maintained by JISAO is the traditional PDO index. It’s used most often in climate-related studies. 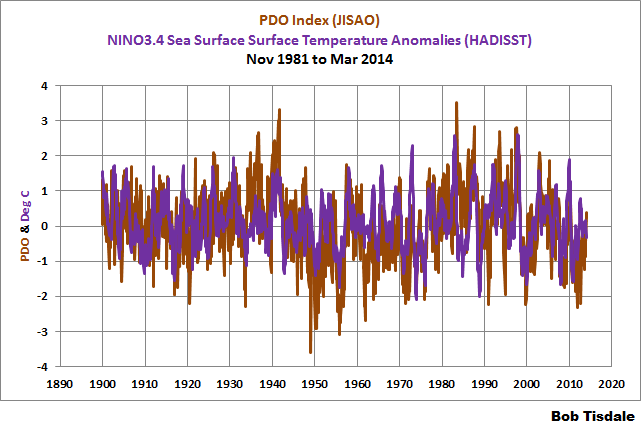 But the JISAO PDO index is derived from three sea surface temperature datasets, two of which are obsolete. The PDO data from JISAO are calculated from an obsolete version of the UKMO sea surface temperature data from January 1900 to December 1981 and from an obsolete version of the Reynolds OI sea surface temperature data from January 1982 through December 2001. JISAO uses the up-to-date Reynolds OI.v2 sea surface temperature data since January 2002. So the JISAO PDO data are a mix of very different sea surface temperature datasets. The Monthly climate indices webpage at the KNMI Climate Explorer includes 3 PDO datasets: the JISAO data, and PDO data based on two other seas surface temperature datasets: NOAA’s ERSST.v3b data and UKMO’s HADSST3 data. PDO based on HadSST3 (1850-now). 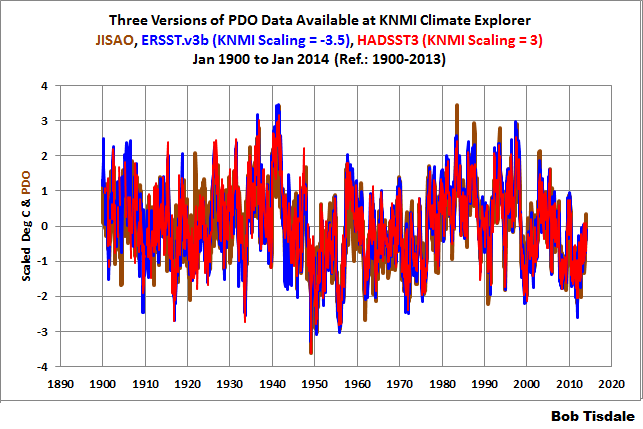 Looking at the three PDO datasets in monthly form, Figure 24, the three datasets appear to agree reasonably well. In fact, the ERSST.v3b and HADSST3 data correlate well with one another (correlation coefficient of 0.94). But the correlations are lower between the JISAO PDO data and the other two datasets (JISAO PDO correlation coefficients: 0.85 with ERSST.v3b data and 0.86 with HADSST3 data). With that in mind, if you were studying the PDO in close relation to a specific surface temperature dataset, it might be best to use the PDO data associated with the surface temperature data being studied. Figure 25 presents the three PDO datasets smoothed with 121-month running-mean filters. They agree better in some periods than in others. 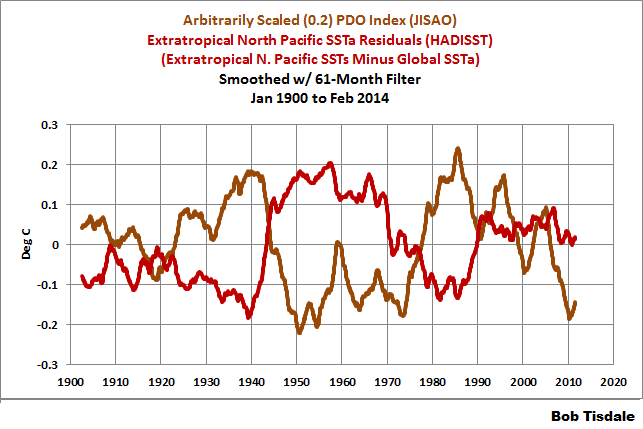 The temporary upswing in the JISAO PDO data from the mid-1950s to about 1970 is not as great as the other two datasets. And the JISAO PDO does not dip as low as the other two in the early part of the 20th century. A couple of things to note about Figures 24 and 25: On the data pages at the KNMI Climate Explorer for the ERSST.v3b- and HADSST3-based PDO data, KNMI lists the scaling factors applied to those datasets. (Thanks, Geert Jan.) For the ERSST.v3b-based PDO data, the scaling factor was -3.5, and the HADSST3-based PDO data was scaled by a factor of 3.0. I suspect the scaling factors are based on the standard deviations of both datasets…and that they have been rounded. Note also that the ERSST.v3b data were scaled by a factor of -3.5. This indicates the ERSST.v3b-based PDO data were originally inverted…or the opposite sign of how the PDO data is normally presented. 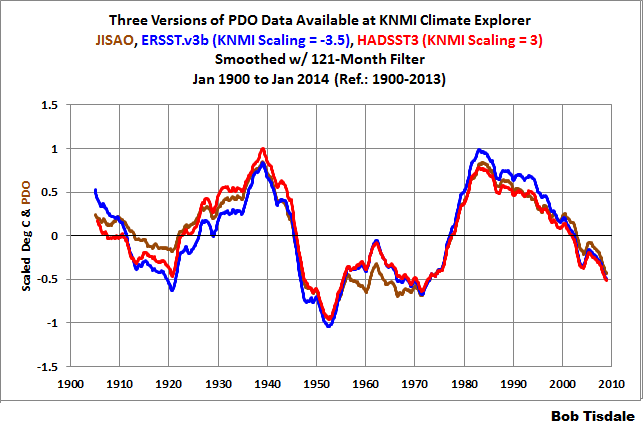 KNMI then multiplied the ERSST.v3b PDO data by a negative number in order to present them as we’re used to seeing them. With the scaling factors, assuming the values are rounded, we can get a rough estimate of the actual variations of the PDO data in terms of sea surface temperatures in deg C.
When I first began to study ocean processes, I believed (wrongly) that the Pacific Decadal Oscillation were El Niño-like and La Niña-like events taking place in the North Pacific. One of the influences on my initial misunderstanding was how the PDO data were presented. Overlooking the fact that I didn’t know how greatly the standardization exaggerated the PDO index, the graphs of the raw PDO data showed monthly variations in excess of -2.0 to +3.0, which were comparable to, if not larger than, the variations in the sea surface temperature of the equatorial Pacific. See Figure 26. The standardization of the JISAO PDO data may also have greatly exaggerated the importance of the PDO for other people. Hopefully, this presentation will put an end to that. I later got a rough idea of the impact of the standardization of the PDO data (the magnitude of the scaling). (See the discussion of Figures 10 and 11 in the post here.) I used the North Pacific residual data (shown above smoothed in Figure 18), not the formula used by JISAO to determine the PDO. Based on the scaling factors determined by KNMI for the HADSST3- and ERSST.v3b-based PDO indices, my scaling factor was 1.5 to almost 2 times too high. My apologies. But I was on the right track. So let’s look at the magnitudes of the variations of the HADSST3 and ERSST.v3b PDO indices in terms of deg C. To accomplish this, we’ll simply divide those PDO indices by the scaling factors listed by KNMI, leaving the ERSST.v3b PDO data inverted…and keeping in mind that the listed scaling factors were likely rounded. So we’re looking at rough approximations of the two PDO datasets. 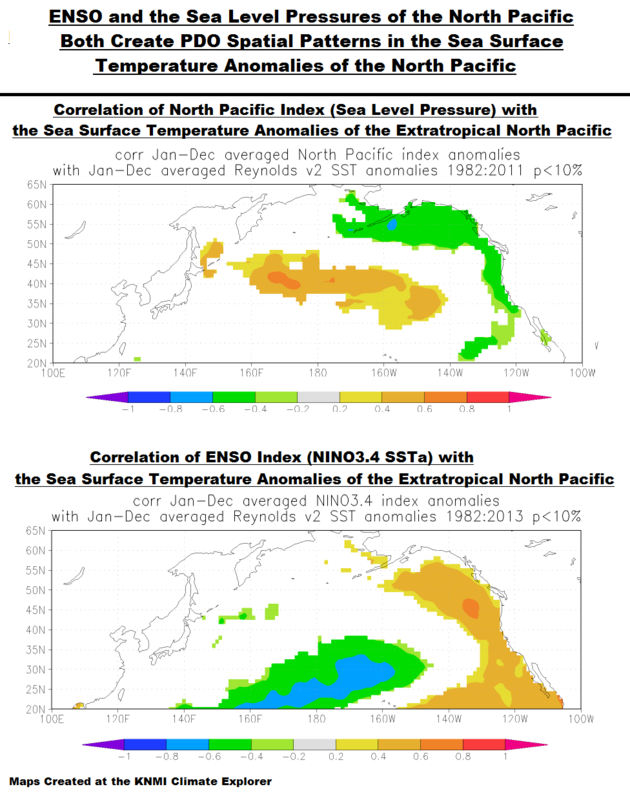 In Figure 27, the results are compared to NINO3.4 sea surface temperature anomalies, our ENSO index, as a reference. 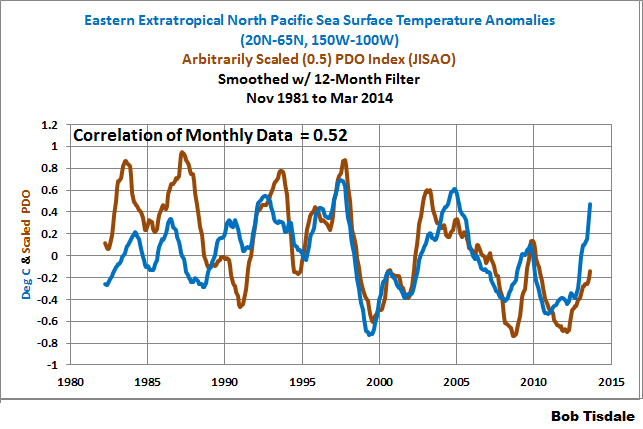 The sea surface temperature-based ENSO signal dwarfs the variations of the two PDO datasets. 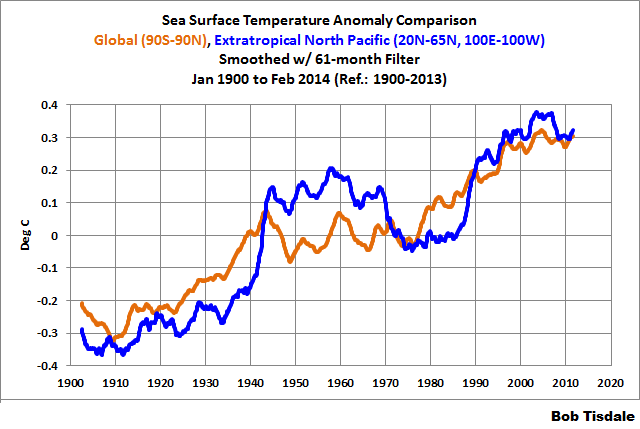 That’s not to say that the sea surface temperatures of the North Pacific are not important. As we discussed above and illustrated in Figure 18, the multidecadal variations in the sea surface temperature anomalies can enhance or suppress the warming of global sea surface temperatures. 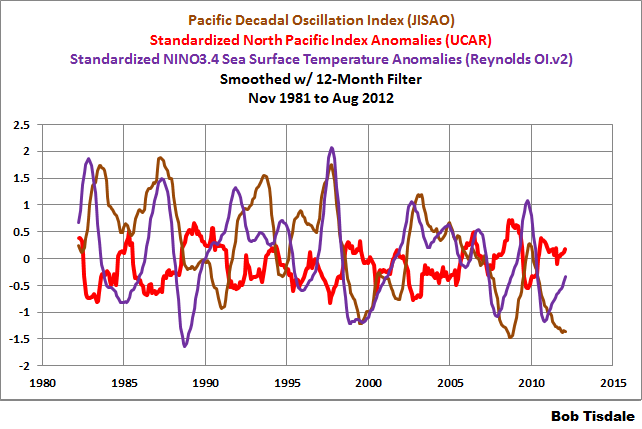 And again, the PDO index data do not represent the sea surface temperatures of the North Pacific. I had a recent blog discussion about the PDO and trade winds. In it, I showed how the variability of the trade winds of the equatorial Pacific was more closely related to an ENSO index than they were to the PDO index. That really should have been expected, but I suspect the person I was having the discussion with was basing his/her understanding of the PDO on beliefs, not on data. Because you somehow believe that the PDO influences the trade winds of the equatorial Pacific, I have an exercise for you. 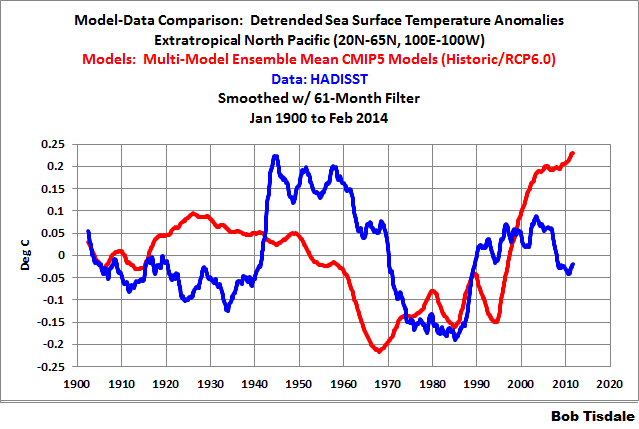 To simplify things, we’ll look at the satellite era of sea surface temperatures (Nov 1981 to Mar 2014). Take the weighted average of the NOAA trade wind index anomalies, basing the weighting on the longitudes included. The West Pacific Trade Wind Index anomalies are here, the Central Pacific Trade Wind Index anomalies here and West Pacific Trade Wind Index anomalies here. (The second of the three datasets on each page) After you’ve determined the weighted average of the trade wind indices, standardize it. Then, to your spreadsheet, add NINO3.4 sea surface temperature anomalies (Reynolds OI.v2) from the NOAA NOMADS website. We’ll use that as our ENSO index. Standardize it as well. Now add the JISAO PDO data. It’s already standardized so you can save yourself a step. 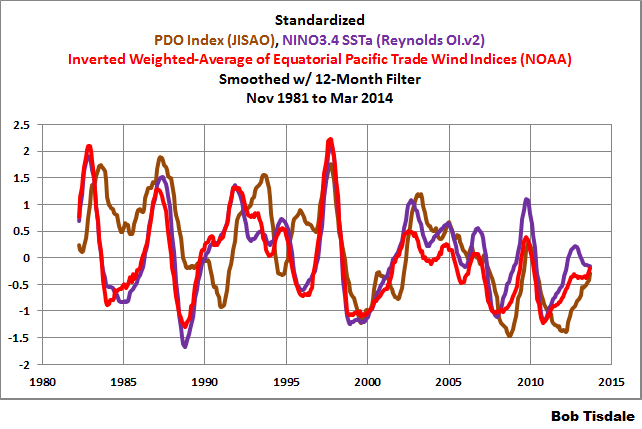 Now determine how well the weighted average of the trade wind data correlates with the PDO and with the ENSO index. The correlation coefficient of the trade wind data with the PDO is about -0.36. Not very good. The correlation coefficient of the trade wind data with the ENSO index is about -0.82. Much better. 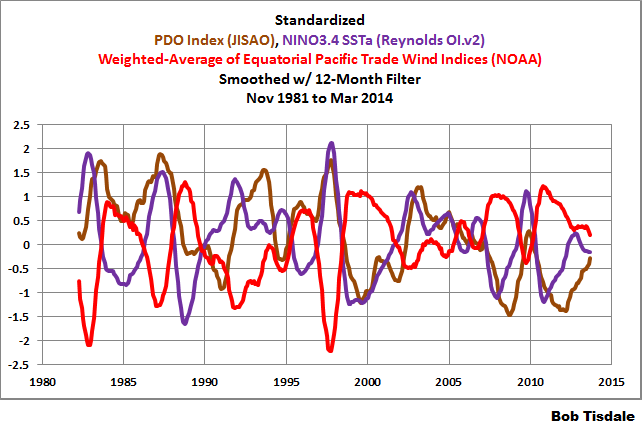 Note how poorly the PDO data agree with the trade wind data before the 1997/98 El Niño, while the ENSO index and the trade wind data mimic one another over the term of the data. 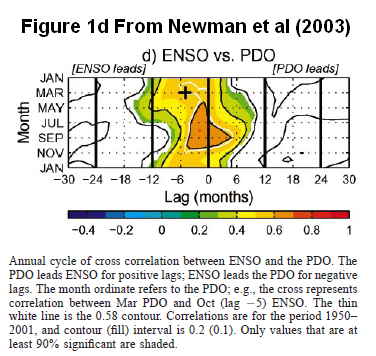 That pretty well sums up the differences between the PDO and ENSO. If you’d like, you’re more than welcome to continue to believe that the PDO influences the trade winds of the equatorial Pacific, but your beliefs will not be supported by data. The JISAO PDO Index values have been positive this year, and for March 2014, it is at a moderately positive value of 0.97. Curiously, around the blogosphere, we’re being told the PDO is “cool”. DO THE CLIMATE MODELS USED BY THE IPCC PROPERLY SIMULATE THE MULTIDECADAL VARIATIONS IN THE SEA SURFACE TEMPERATURES OF THE EXTRATROPICAL NORTH PACIFIC? This post included discussions of the PDO and the multidecadal variations in the sea surface temperatures of the extratropical North Pacific. So let’s compare models with data, and we’ll start with a proxy for the PDO, and I’ll borrow a few graphs from an earlier post. In the North Pacific, the variations are dominated by the sea surface temperatures of an area east of Japan known as the Kuroshio-Oyashio Extension (or KOE). The inverse relationship between the Pacific Decadal Oscillation index and the sea surface temperatures of the Kuroshio-Oyashio Extension are shown in Figure 30. They’re basically mirror images of one another. Let’s see whether the models can simulate the multidecadal variations in the sea surface temperatures of the Kuroshio-Oyashio Extension. For this example, we’ll subtract the global sea surface temperatures from the sea surface temperatures of the Kuroshio-Oyashio Extension. (It’s similar to the method used by Trenberth and Shea for the Atlantic Multidecadal Oscillation.) The coordinates used for the Kuroshio-Oyashio Extension data are 30N-45N, 150E-150W and the global sea surface temperature data are for all of the global oceans, 90S-90N. (The multidecadal variations in the Kuroshio-Oyashio data in Figure 31 are different those in Figure 30 because they were determined using different methods. Also note they have not been standardized in Figure 31.) As shown with the blue curve in Figure 31, there are very large multidecadal variations in the sea surface temperatures of the Kuroshio-Oyashio Extension after the global data has been subtracted. On the other hand, using the models prepared for the IPCC’s 5th Assessment Report, we get totally different results when we subtract the modeled global sea surface temperatures from the modeled sea surface temperatures of the Kuroshio-Oyashio Extension. (See the red curve in Figure 31.) 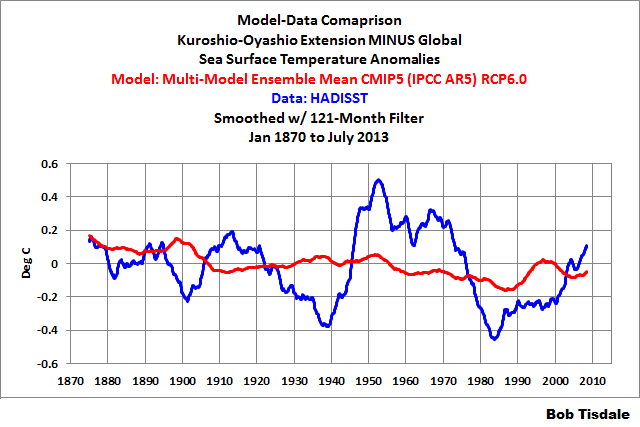 This indicates the models do not simulate the multidecadal variations in the sea surface temperatures of the Kuroshio-Oyashio Extension. Because the variations in the surface temperatures of the Kuroshio-Oyashio Extension region dominate the North Pacific, the failure of the models to show the same multidecadal variations suggests that greenhouse gases (and aerosols) used in the models are not responsible for the warming (and cooling) in North Pacific sea surface temperatures. And let’s confirm that the models also do a horrendous job of simulating the multidecadal variations in sea surface temperatures for the entire extratropical North Pacific. In this case, we’ll simply detrend the sea surface temperature anomaly data and the climate model simulations for the extratropical North Pacific. See Figure 32. That recent divergence between the models and the data stands out like a sore thumb. We’ve already discussed why we use the multi-model ensemble-member mean in our model-data comparisons. (See the post here.) The model mean represents the forced component of the models. That is, the model mean presents how surface temperatures should vary if (big if) their variations were in response to the forcings used as inputs to the climate models. Obviously, the multidecadal variations in sea surface temperatures of the extratropical North Pacific are not in response to the forcings used to drive surface temperatures in models. DID LAST YEAR’S UNUSUAL WARMING EVENT IN THE EXTRATROPICAL NORTH PACIFIC REGISTER ON THE PDO INDEX? Last year, there was an unusual warming of the surface temperatures of the extratropical North Pacific. See the post here. Sea surface temperatures there have lowered somewhat, as shown in Figure 33, but they do not appear to have returned yet to previous levels. I’ve also included the PDO index (scaled) in Figure 33 to confirm that the warming event did not register on the PDO index as it occurred. 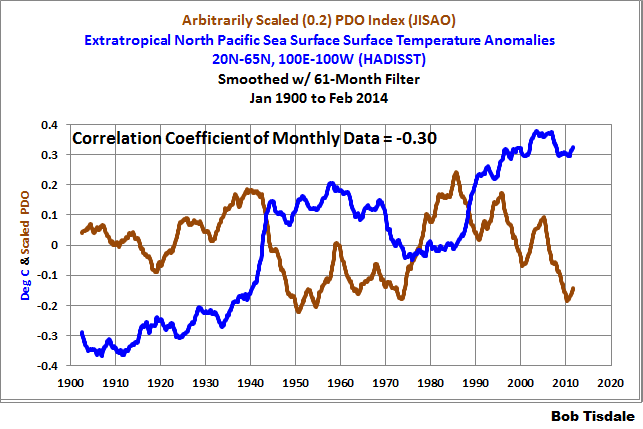 Again, the PDO index does not represent sea surface temperatures of the North Pacific. And while the sea surface temperatures of the Eastern Extratropical North Pacific have cooled over the past 32 years (see the graph here), the March 2014 sea surface temperatures continue to be unusually warm. See Figure 34. It will be interesting to see what happens in upcoming months as the current El Niño conditions continue to develop. Hopefully, this post provided you with a better understanding of the Pacific Decadal Oscillation…what it is, and more importantly, what it isn’t. For some reason, many people seem to have emotional ties to the Pacific Decadal Oscillation, so I suspect this post will not be well received by some. But, as always, data trumps assumptions and speculation, and I present data, not assumptions or speculation. We didn’t get a chance to discuss ENSO processes in this post. But my ebook Who Turned on the Heat? goes into a tremendous amount of detail to explain El Niño and La Niña processes and the long-term aftereffects of strong El Niño events. Who Turned on the Heat? weighs in at a whopping 550+ pages, about 110,000+ words. It contains somewhere in the neighborhood of 380 color illustrations. In pdf form, it’s about 23MB. It includes links to more than a dozen animations, which allow the reader to view ENSO processes and the interactions between variables. This entry was posted in 2014-15 El Nino Series, El Nino-La Nina Processes, Model-Data Comparison SST, PDO. Bookmark the permalink. I read you book “Who Turned on The Heat” and noticed your El Nino power index chart. I compared the index to Nino3.4 data and noticed that after strong or medium El Nino event, the Pasific Ocean may enter into “El Nino resonance”. (See picture) It seems that strength of the El Nino pulse affects also wavelength of resonance. Is it just coincidence ? Thanks, Bob. Another excellent post that will get links from my pages. Sorry to disturb you again, but I think you might by interested of following finding. While seeking correlation with El Nino and scandinavian temp records, I noticed that it is possible to “forecast” upcoming La Nina event by comparing Nino3.4 dataset to RSS MSU NH lower troposphere dataset. Arska: Interesting observation. To help my own visualization, I detrended the Northern Hemisphere then compared them to scaled NINO3.4 sea surface temperature anomalies, and I smoothed both datasets with 12-month filters. 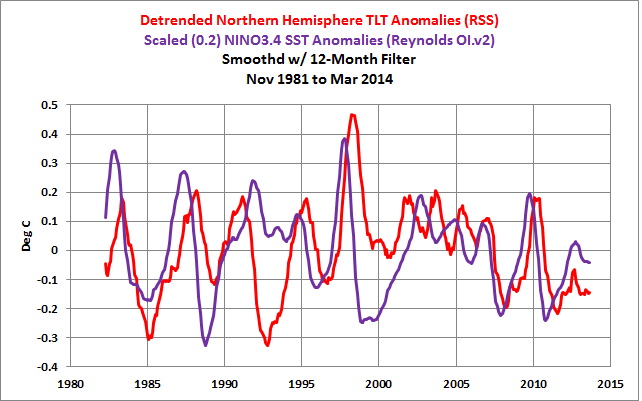 It’s interesting that the Northern Hemisphere TLT anomalies and the NINO3.4 data are out of synch from 2001 to 2005, then seem to realign for the 2006/07 El Niño. And it’s really unfortunate that the eruption of Mount Pinatubo dropped the TLT anomalies during the period of 2001 to 2004. As you might remember, I have proposed that the 1991/92 and 1994/95 El Niños were secondary events to the 1986/87/88 El Niño and that the 2002/03 and the 2004/05 and 2006/07 El Niños were secondary events to the 1997/98 El Niño. My thought was that the secondary El Niños were responses to leftover warm water from the primary El Niños. Some researchers in the late 1990s were treating the early 1990s as one long El Niño. Bob, I prepared and translated into Spanish an article under the title of “The Relationship Between the PDO and ENSO” to go with the links. Thanks again. I agree with your view on secondary El Ninos. It seems that bigger El Ninos launch some kind of “fading oscillator phenomenon” on Pacific. I studied more the releationship between El Ninos and NH RSS MSU TLT dataset, and I noticed that the NH temperatures are “going crazy” before any major El Nino event. It seems that we should have noticeable temperature drop on the Northern Hemisphere in order to get full scale El Nino event. For the current 2014 conditions, there hasnt been any temp drop in NH so far, so I think there is no “room” for El Nino to develop full scale..
Arska, we’ll have to watch and see how your prediction goes. I hope it works… at least it has correctly predicted all the stronger El Nino events so far. Bob, I have noticed that the graph that I show at http://www.oarval.org/pdo-f-pg-Global-21Jul14.gif (taken from http://www.ncdc.noaa.gov/teleconnections/pdo/) has been replaced by an interactive graph. Andres, every time I turn around, NOAA has updated a webpage or graphic and many times it’s not for the better. That’s a good example.